Laramie is a city and the county seat of Albany County, Wyoming, United States. To find traveler tips, where to stay, ratings, and more tourist information, go to the Laramie trip itinerary planning website . Great Bend to Laramie is an approximately 8-hour flight. You can also drive. The time zone difference when traveling from Great Bend to Laramie is minus 1 hour. Expect slightly colder temperatures when traveling from Great Bend in July; daily highs in Laramie reach 81°F and lows reach 50°F. On the 20th (Sat), you're off toYellowstone National Park. Yellowstone National Park is known for nature, wildlife, trails, historic sites, and nightlife. 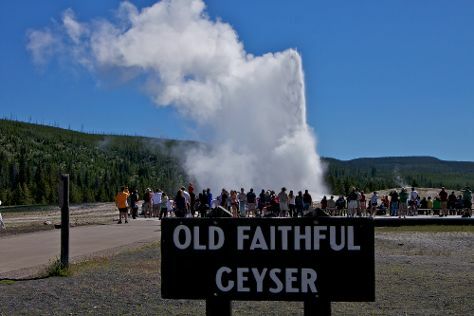 Your plan includes some of its best attractions: hike along Artist Point, take in the natural beauty of Old Faithful, contemplate the waterfront views at Madison River, and take in the dramatic natural features at Lower Geyser Basin. To see traveler tips, ratings, and more tourist information, go to the Yellowstone National Park trip website . Explore your travel options from Laramie to Yellowstone National Park with the Route module. Plan for little chillier temperatures traveling from Laramie in July, with highs in Yellowstone National Park at 73°F and lows at 39°F. Finish your sightseeing early on the 24th (Wed) to allow enough time to travel to Casper. Casper is a city in and the county seat of Natrona County, Wyoming, United States. To see reviews, ratings, where to stay, and more tourist information, use the Casper trip site . Explore your travel options from Yellowstone National Park to Casper with the Route module. Traveling from Yellowstone National Park in July, things will get a bit warmer in Casper: highs are around 89°F and lows about 53°F. Wrap up your sightseeing on the 25th (Thu) early enough to travel back home.